You can edit a post or an event in the group Lounge. Managers can edit posts written by another manager. Managers cannot edit posts written by a member; if necessary, you can delete a member's post. Find the 3 dots in the top right corner of your post, and click Edit post. After you edit, click Save. You have the option of sending that update to your members, or to simply edit the content without notifying your members. On the event page, click Manage Event. This menu item is available is available for events in the future, not for events in the past. If you're on the Feed instead of Events, click the 3 dots and choose Edit post. At the bottom, you'll see the event type you already chose. This is not something you can edit. To save your changes, click on Save Changes. You can send out your event changes via email. 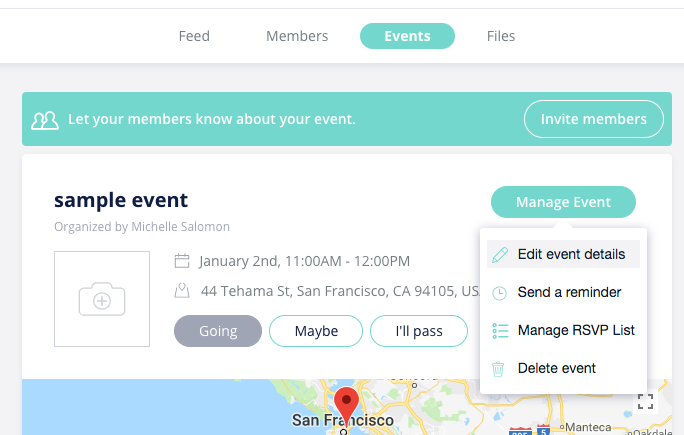 If you do send via email, and if the group email frequency is set to Instant, or if an individual member changed their settings to Instant, this update will be reflected in the event on your members' personal calendar. 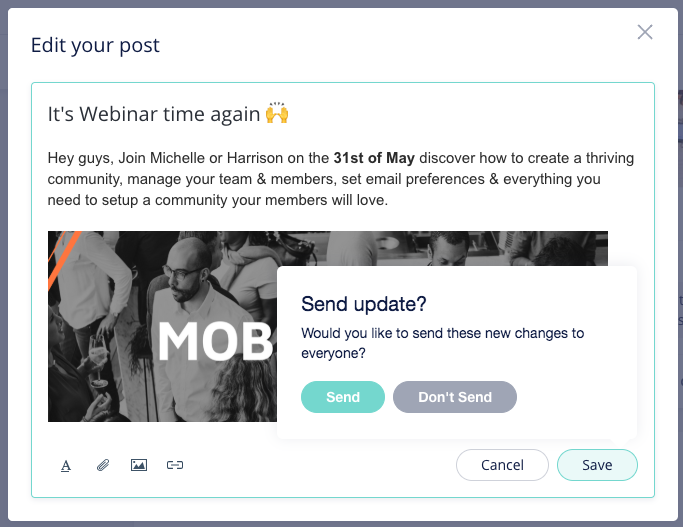 If you click Send but your group email frequency is set to Daily Digest or Never, the only members who will actually get this change via email are those who have over-ridden your default setting from Daily Digest or Never to Instant.